Aftop walking behind his father after Speak 4 Silent Voices purchased new crutches for his father. Aftop is 10 years old and is an amazing child. He lives on the street with his father who is a former rickshaw puller who was hit by a car and has now lost the ability to move his right leg. Due to his physical disability, his father can no longer work and is restricted to life as a beggar. However, in spite of his fate, his father will not allow Aftop to be a beggar as well. We initially attempted to put Aftop in boarding school but he said with great sadness that he cannot leave his father because his father needs him. Over the course of getting to know Aftop, I have learned that without him, his father would not survive. Aftop, carries their life with them in a bag. Everything the two of them own in the world fits into one bag. Their pots for cooking, their blankets for sleeping, both of their clothes, etc... Being on crutches, Aftop's father cannot carry the bag. He needs his son and his son needs him. Due to this situation we have placed Aftop in day school where he is happy and suceeding. He loves school. It is clear to see his confidence grow as he learns more and dreams of a brighter future for himself and his father. Above is Kuzum, Kristina Maglic, Bandana and the children's mother, Geeta. This is Kuzum, Abhishek, and Bandana. Their father is ill and their mother is a servant maid in the home of a wealthy Indian family where she must live away from her children 6 days a week. Their mother works incredibly hard to feed and clothe her children but their education was a luxury she was not able to cover. Thank you to their sponsors for changing their lives. Above is the beautiful little Bandana. Baloo is 8 and Sanya is 7. Both of these children need a sponsor to continue their education. They come from an abusive household where their mother is struggling to care for them in difficult circumstances. Thank you to their sponsors for changing their lives. We took the children shoe shopping since they were wearing the shoes in the photos on the left. We had never seen children have so much fun buying school shoes. Comparing their lives with those of children in the west truly shows not all childhoods are created equal. Words cannot describe the suffering Mona has endured in her 7 years of life. She lived on the streets under a freeway overpass when we first met her. We found her while working with our mobile clinic unit. She had a large open wound on her head with maggots and flies in it. After spending the first few days treating her wound, all of the volunteers for our Mobile Clinic fell in love with Mona. She is wise beyond her years and filled with so much kindness. Yet anyone who knows her cannot deny how funny she is, she has a goofy mischievous side. It broke our hearts to meet her mother and learn her mother is an abusive drug addict. She forced Mona to spend her days begging on the streets. Shortly after getting to know know Mona we noticed her become extremely weak, to the point where we rushed her to the hospital. Mona almost died in the hospital and had to receive an intimidate blood transfusion. She was diagnosed with Typhoid, Malaria, Tuberculosis, Antibiotic Drug Resistance, and severe malnutrition. It has been nearly seven months since Mona was first admitted to the hospital. She was recently released from a long term medical care facility. She is now living in a shelter where she is recovering, and is finally getting the chance to be a child. After a long battle we have been able to keep Mona's mother from abusing her further. We are praying that we are able to gain legal rights to keep Mona safe until she is old enough to care for herself. Testing out Sumit's new school shoes. Sumit is 5 years old and is in kindergarten. He lives on the sidewalk with his mother Arty and his stepfather Suraj. 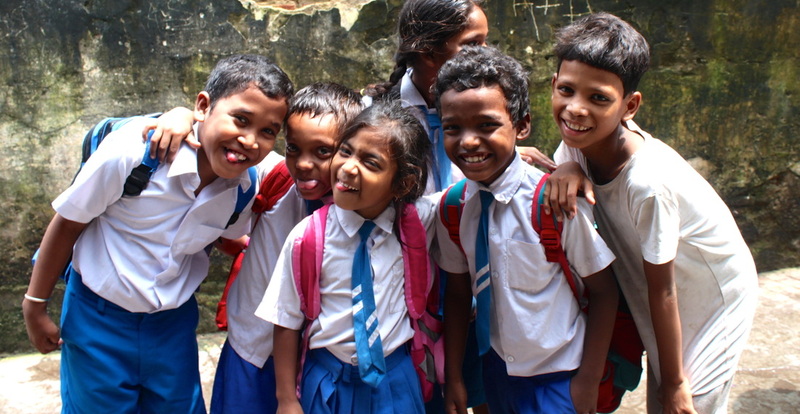 They are a loving family and support Sumit's education with all of their hearts. His mother is a house cleaner and his stepfather is a bicycle transporter. In spite of their hard work, Sumit's parents do not make enough to educate their son. Sumit's education has been lovingly sponsored by María Beúnza Valero who was able to meet him while volunteering in Kolkata last summer. 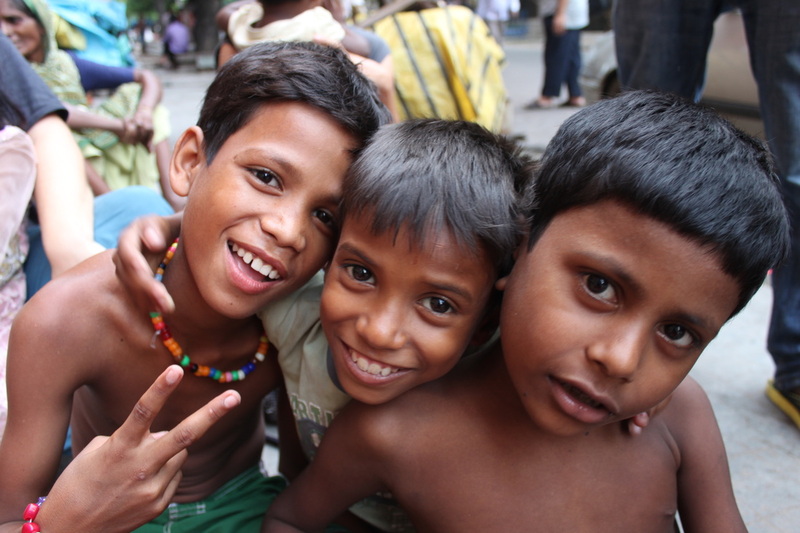 As soon as you decide to become a sponsor we contact one of the many children we know in Kolkata who are interested in attending school but currently do not have the funds to do so. The most expensive part of attending school in India is the initial enrollment fees, the monthly tuition is relatively inexpensive. For this reason the children we choose to sponsor must first prove themselves to be interested, dedicated and responsible for their own education. To be sure the children are dedicated we first enroll the children in tutoring for at least one month prior to the start of school. If the child proves to be dedicated we then make the commitment of enrolling the child in what is called a private English medium school (these are the best schools in Kolkata). The children continue to attend tutoring in addition to school for the first year in order for them to catch up and stay on track. Since we work with 100% transparency, once the child is enrolled in school the sponsor will receive copies of the enrollment forms, photographs of their child, as well as copies of their progress reports as they become available. Speak 4 Silent Voices is proud to state that we are a 501(C)3 tax-exempt organization. Therefore, all financial contributions are financially tax deductible.